Bandung Ultra 100 is not only a new entry in the 2018 Asia Trail Master Championship, the event has also been selected after a long deliberation as the Indonesia SuperTrail this year! 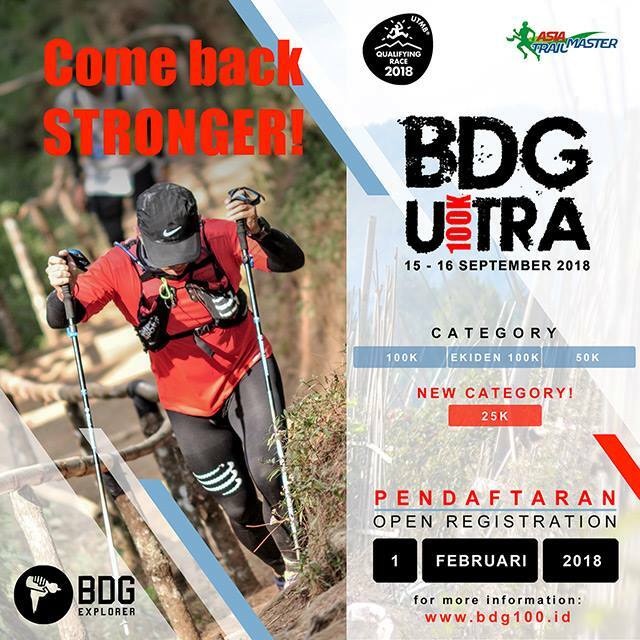 The organisation by the renowned Bandung Explorer Team - which has Arief Wismoyono and Ruth Theresia in its ranks - was impressive last year when BDG 100 was a Candidate Race, and the race courses technical, beautiful and challenging. All in all, we believe BDG 100 is a great new SuperTrail! The event is held on 15/16 September and has an A to B course with start at the well-known Tahura Park. That is the only similarity with the Tahura Trail of last month. BDG 100 chooses an entirely different route that mainly goes up and up and up. You will be surprised how high the mountains around Bandung are! There is about 6500 metres of elevation gain to be conquered, which means the new Indonesia SuperTrail has one of the hardest mountain courses on our calendar, which of course is rather typical of Indonesia. Yet, these events remain very popular precisely because they are so amazingly beautiful. In a nutshell, do not take this race lightly, prepare yourself properly and enjoy Bandung Ultra 100 mid-September. Registration is open. Please note that only the 100K will be credited as a points race for the Asia Trail Master Championship. This being a SuperTrail, all finishers will get 50 bonus points. The race winner will collect 550 points instead of the regular 500. More details can be found here and will be added as they become available. The race course will be the same as in 2017.